As we sit in the airport in Santorini a two hour wait before we board looms ahead of us, I'm all set with a blog I am being forced to write before I can read a newly discovered book downloaded on the iPad. Our time in the Greek Islands was a memorable one, more of my holiday style, sleeping in, walking on the beach, swimming three times a day in calm crystal clear water, sipping drinks while overlooking incredible views, etc. 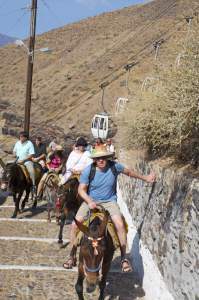 etc... One of the most memorable experiences we had in Santorini was taking a 'leisurely stroll' up a huge cliff on a huge, crazy donkey, no biggy. As I was lifted up onto a ginormous donkey with Mum I knew that this was not going to be the experience I had anticipated. 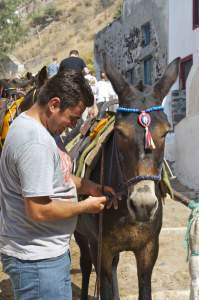 As soon as we had both been placed, not exactly securely, on the donkey, off it went. Our donkey seemed to have a problem with being behind everybody else so it took off in a hurried manner and overtook all the others, placing itself steadily in front of the rest. It then decided it deserved a rest and stopped, in the middle of the path, and stood there for a minute before madly racing ahead again to reposition itself in front, this continued on for the whole time, while it also consistently kept zig zagging from side to side of the path, bashing into the stone walls in the process. 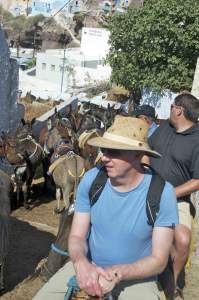 I think by the time we arrived at the top of the hill we were all relieved to deposit ourselves from the donkeys which we were expected to do ourselves, without any help. I remember literally praying for my life while I was on that donkey, believing that I could die at any moment, and of course I'm not exaggerating at all (wink wink) but it was a pretty scary experience, mixed of course with a bit of laughter and smiles, it measured up to be at least an experience that I will never forget.